PACLINE Overhead Conveyors has developed a pre-engineered system for handling the 10 to 12 foot long copper bars used in Electro-Plating shops. This sophisticated design has eliminated the necessity of using hand operated trolleys for the transfer of workloads to and from the hoist lines of plating tanks. The PAC-LINE™ overhead conveyor, using our standard No. 175 Bar Carrier Trolley, can transport loads in excess of 400 lbs. Our special design allows the 10 to 12 foot long work bar to manoeuver the standard radius curves of the overhead conveyor with ease. 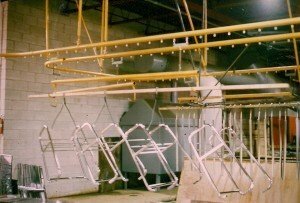 Loaded racks can be easily transferred from the overhead conveyor to the hoist for dipping as required. This system is designed to allow the transfer of the loaded work bar directly from the hoist to the overhead conveyor. This loading signals the conveyor to run until the empty No. 175 trolley is in position to receive the next loaded work bar from the plating line. The same system applies to the opposite end of the plating tanks. Loaded work bars are automatically delivered to the front of the line of plating tanks. The hoist can quickly pick up the loaded bar carrier, beginning the plating process. The entire conveyor system is synchronized to allow both the empty bar carrier and the loaded carrier to stop automatically at opposite ends of the elecroplating line, so that the loading and unloading of the hoist can be completed simultaneously between the conveyor’s cycles.